As the largest sand island in the world, Fraser Island is home to some spectacular landscapes and an incredible range of views that are both surreal and incredibly beautiful. A Fraser Island tour will take you to all the best spots, but if you need a push in the right direction, here’s why you should definitely visit. Exploring Fraser Island by 4WD is one of the best ways to see everything it has to offer. Because it is predominantly made up of sand, there are numerous sand dunes to ride over which provide a good old adrenalin rush. The island itself is renowned for its sprawling pristine beaches, its ancient rainforests, and lakes, and all of these can easily be discovered with the help of a 4WD. Fancy something a little more laidback? 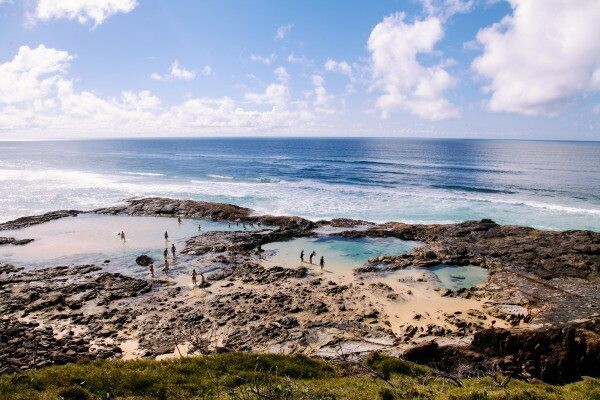 The island’s Champagne Pools are the place to go. These rock pools are formed by sea water crashing against a series of pocked rocks, making the perfect place for a quick dip. Perhaps the biggest draw of Fraser Island is its collection of impossibly clear lakes. Lake McKenzie, the most popular, is a perched lake set at the top of a sand dune — kind of like an oasis. The sand at the lake is made of pure white silica, providing health benefits for the skin and body, while the fresh water means there is no marine life here. Elsewhere, Eli Creek provides a backdrop of incredible beauty. This is the largest freshwater creek on the east of Fraser Island, and it boasts impossibly blue and green waters that are ideal for swimming in. The flanking plant life almost gives it a tropical jungle feel, while the white sands are perfect for kicking back and relaxing on after a dip. As well as lakes and natural water spots, Fraser Island is also renowned for its eclectic selection of wildlife. In fact, it is famed for its pack of dingoes that roam the island. In the cooler months, keep your eyes peeled for migrating humpback whales and a dolphin or two, as well. In total, there are over 350 different bird species, 50 mammals, and 80 reptiles that call the sands, rainforests and waters of Fraser Island home. Fraser Island has so much to offer visitors, whether you’re looking for some fast-paced adventures or simply want to check out some of Australia’s mesmerising wildlife. For details about our Fraser Island Tours, please visit our website.